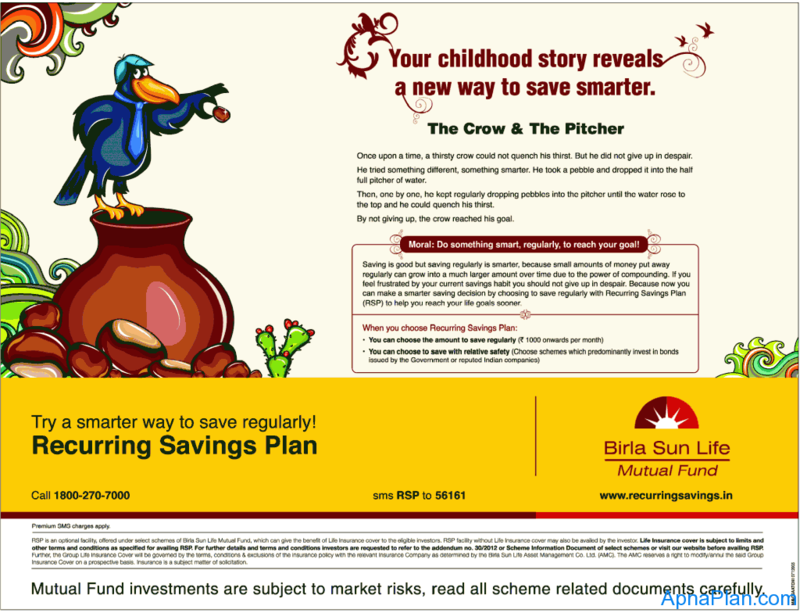 Birla Sun Life Mutual Fund has put big front page advertisement in all leading dailies about its Recurring Savings Plan (RSP). On checking out the details of the RSP, you would realize it’s the same old Systematic Investment Plan (SIP) coupled with free group life insurance with a new name of Recurring Savings Plan (RSP). Birla Sun Life already has a similar offering with the name of Century SIP which offers free group Life insurance with long term SIP in certain mutual Funds. The only difference between the new RSP and old Century SIP seems to the family of funds you can invest in. Birla Sun Life Medium Term Plan – This is an open ended income fund, which is a debt fund and would invest in debt securities and money market instruments. Birla Sun Life Monthly Income – This too is an open ended income fund which is slightly more risky than the above fund as this can invest a maximum of 15% in equity markets. Other than the above I could not find any difference between Century SIP and RSP. In case of joint unit holders in the scheme, only the first unit holder would be eligible for the insurance cover. Non Resident Indians (NRIs) and Persons of Indian Origin (PIOs) are eligible to invest in Birla Sun Life RSP subject to fulfillment of certain additional criteria. e.g. For an investor at the age of 40 yrs 5 months, tenure of RSP shall be a period of 14 years and 7 months i.e. period remaining for the attainment of 55 yrs of age. The Insurance cover will start from the commencement of Century SIP. However, only accidental deaths will be covered for the first 45 days. At the end of the tenure. i.e., upon completion of 55 years of age. Both the funds available for RSP are good funds in their respective categories. But I don’t think it’s a good option to do long term SIP in debt funds. Historically Income funds have given a pre-tax return of 5% – 10% while MIPs have a return in the range of 5% – 12%. You can also get this kind of returns by investing in Bank Fixed Deposits, NCDs or Company Fixed or Recurring Deposit Schemes and with certainty of returns. Income Funds are meant to be parking money for short term or as a risk free deposit for a goal which is near. In the RSP case you also have to pay exit load if you withdraw your investment before 3 years which is another drawback. The exit load of 1% – 2% is on the higher side if you consider the average returns might be in the range of 7%. I would suggest staying away from the RSP (its anyway old wine in new bottle) and looking for Century SIP from the same fund house, if you want to avail the benefit of free group life insurance with your mutual fund investment. You can download Birla Sunlife RSP at their website here.